Regis produces quality ice cream in Cyprus since 1952! Οne of the first products to be developed was the CHOC ICE bar the famous “plaka” ice cream, followed by the orange and vanilla lollies. 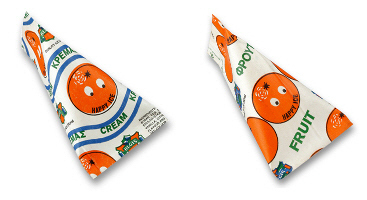 In 1960 the first family packs emerged in four flavours in paper packs and in 1967 the first industrial cone CONO PRIMO was produced, the predecessor of CONO AGRINO. 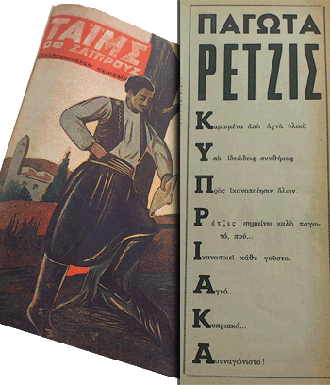 In the sixties and as electricity began to spread all over Cyprus, the company was covering effectively all towns and villages. REGIS quickly became a household name with its branded ice creams. The invasion of Turkey in July 1974, brought about many losses for REGIS as most of its fleet as well as its ice-cream cabinets, were trapped in the North of Cyprus which at the time was the most economically and touristically developed part of the country. Nevertheless, REGIS regrouped and continued its operations. Later in the seventies the company introduced some fun ice creams for the children namely the HAPPY ICE triangles and the PUSH UP tube. In 1982 REGIS pioneered once more by producing the first strained Greek style yogurt on the island, VELOUTE. With its creamy and velvety texture VELOUTE soon became one of the most popular yogurts in Cyprus. Moreover, in the eighties REGIS upgraded its diet and diabetic ice cream and in 1987 introduced an innovation, whereby enzymes were used for the first time for the production of family ice creams, thus reducing lactose and making ice cream a treat for the lactose intolerant customers. In the meantime the company never ceased to upgrade both the factory facilities as well as the distribution centers, its fleet and ice cream cabinets in order to prepare itself for the opening of the market in 1996 and the increased competition from imported ice cream brands. The product range was enriched further with new products, like the premium sticks MEGA. In the same year 1996, the strategic cooperation with MOVENPICK began, which lasted for several years, up until 2015. With the turn of the century the family range was upgraded and new multipacks were introduced. The QUATTRO family pack was also made available as the first and still the only two litre, four flavoured, lactose reduced ice cream offered to the Cyprus market. In the most recent years new and more appealing flavours have been introduced both in the family range as well as in catering ice cream that now has a range of more than 60 flavours. 2011 saw the introduction of the ICE DREAM 500ml range in modern and classic flavours. More recently the ICE DREAM range expanded to one liter packages and it now includes 10 superb flavours , among which the very traditional vanilla with teratsomelo (carob honey). Our company is also producing private label ice cream for a large well known Cypriot supermarket chain in Cyprus. We had many inquiries and are in discussions with companies from abroad for the production of their private label ice cream. As far as the catering industry is concerned we have recently introduced a range of mini ice creams, like bites in several flavours, as well as mini cones, mini lollies etc. All these have been introduced to restaurants and hotels and have been very well received by their customers. Despite the fierce competition REGIS still has a substantial share of the market, while its classics CONO AGRINO and CHOC ICE are among the bestsellers in the impulse ice cream range. Our vision is to maintain and strengthen our position by offering quality ice cream made by pure and carefully selected ingredients. With the ISO 22000 accreditation we assure our customers that our safety levels will always be of the highest standards. We are now well intο our seventh decade! During this long history, we shared with our customers our passion for ice cream and in exchange they extended their loyalty to us. Our vision is to continue to be one of the key players in the Cyprus ice cream market and to be able to continue to offer ice cream “for your own taste” for many more years to come.